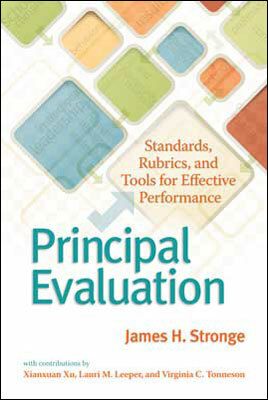 No stranger to the work of James H. Stronge (our district used The Teacher Quality Index to design our teacher selection/hiring process), I was pleased to review a copy of Principal Evaluation: Standards, Rubrics, and Tools for Effective Performance to learn more about Stronge’s frameworks for principal evaluation. I’ve written on the topic of professional development for principals and administrators and principal evaluation in the past, and, like teacher evaluation, the process of principal evaluation is tricky business. The job of the principal is multifaceted and complicated. Developing a framework to fairly evaluate the effectiveness of a principal’s areas of influence has to be a near impossible task. Every principal’s role is different due to the unique compositions of our schools and communities. To standardize it is laughable. However, are there certain characteristics all strong principals possess? Most agree there are. So what are those characteristics, and how can we measure the extent to which a principal possesses them? (Because, as we all know, in public education, if we can’t measure it, it doesn’t exist.) Ahem. Comprehensive Set of Principal Performance Standards, Indicators, and Rubrics – presents seven performance standards and indicators with corresponding rubrics. So why is a principal evaluation model needed? Stronge states that meaningful principal evaluation is important “because quality principals matter, and because principal evaluation matters.” He presents the reader with a wealth of evidence about the value of the principal in effective schools, including their impact on teaching and learning and establishing a positive climate for their schools. Stronge emphasizes that people matter when it comes to improving school effectiveness, and that we need quality evaluation systems in place in order to discern if our principals are effective. 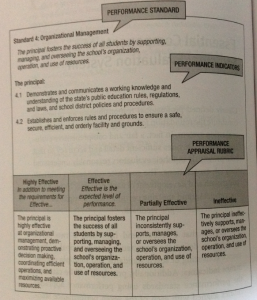 Without these systems, we can’t hope to improve principals in order to increase school effectiveness. Standards 1-6 are performance standards that represent what the principal should know and be able to do. Standard 7 represents the need to evaluate principals based on the results of their work. These standards are aligned to the Interstate School Leaders Licensure Consortium (ISLLC) standards. principals exert both direct and indirect influences on schools and the people who work and learn there. Thus, the framework of principal effectiveness should not only contain standards related to the processes of leadership, but also to the outcomes. Stronge identifies the standards, performance indicators, and appraisal rubrics as the “basic building blocks” for principal evaluation in his system. The remainder of the text details how to document principal performance, rate performance, and use principal evaluation for professional growth and improvement. Recommended data sources include self-evaluation, informal visits and observations, document log (principal’s blog, anyone? Perhaps used in conjunction with the self-evaluation process for reflection? portfolio building? ), climate surveys, goal setting. The rating section of the book details how to calculate scores based on the evidence collected and accompanying rubrics using a four-level rating scale. I glazed over that chapter. The last section of the book includes information for districts wishing to implement the system. I jumped to the “Professionalism” section of the rubrics so I could see what was included in terms of personal professional development recommendations for administrators. Forming a PLN and sharing with connected networks are important venues through which an administrator can grow. I’ve lived it. This could be included in performance indicator 6.9: Assumes responsibility for own professional development by contributing to and supporting the development of the profession through service as an instructor, mentor, coach, presenter, and/or researcher. Stronge highlights research from various sources that indicates the need for principals to serve as “lifelong learners” and to participate in development networks with other principals. There are few references to technology use in the framework. One is in the description of the Organizational Management standard, where it is expected that principals support implementation, include technology use in their school’s vision, and support scheduling and use of equipment. There’s nothing specific in terms of technology in the performance indicators, and no compelling argument is made in terms of ensuring principals themselves stay current and/or model the use of technologies themselves. To be fair, the framework states performance indicators “include but are not limited to,” so districts and schools could easily craft their own to meet the standards based upon individual needs. In summary, Stronge’s model is very comprehensive. With so many performance indicators (there are 13 alone under the Instructional Leadership standard), it is definitely no small undertaking to attempt to implement and use this system with all principals in a school district. I shudder at the thought of the paperwork that accompanies this framework (like all similar frameworks). I’d hope for districts to consider putting the emphasis on self-directed learning using these standards as a guide. The principal could determine where he/she needs support and improvement, develop a personal growth plan, and work with their colleagues and expanded networks to achieve their goals. I think the many important qualities of administrators such as trust-building capacities, climate shaping, and instructional leadership are covered thoroughly. What are your thoughts on Stronge’s model? What essential elements has he included? What’s missing? Can this model be used realistically in our schools today? What positive experiences with principal evaluation models have you had? For districts interested in utilizing Stronge’s work to craft their administrative evaluation models, ASCD offers a study guide on the work here.